Each year BP releases its Annual Statistical Review of World Energy, an extensive data collection providing a snapshot of global energy use around the world. The Review includes data around reserves of oil, gas, and coal, energy use by fuel type, electricity generation, carbon emissions, and other related data. This provides an excellent snapshot of current global energy use, but perhaps more importantly, BP has collected data going back to 1965. 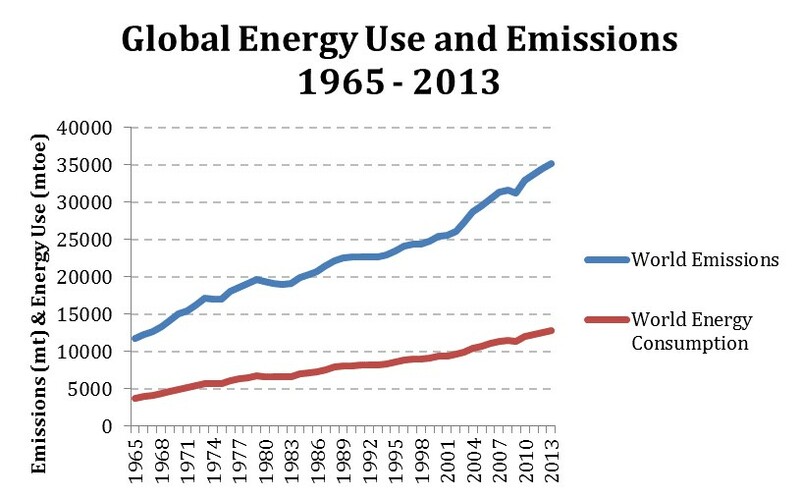 This allows us to take a detailed look at the way the global energy economy has evolved over the last fifty-plus years. 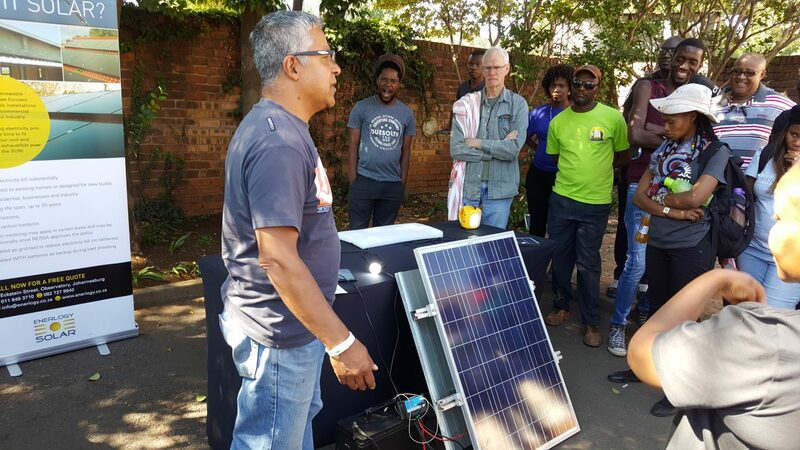 As the energy industry has an outsized impact on both the global economy and the global environment, building an understanding of the ways in which the industry has evolved can help explain why things are the way they are, and how they’re likely to change going forward, particularly as climate change and other environmental issues push to the fore. So, what can we learn from this year’s Review? Comparing the amount of primary energy consumed (in electricity generation and industrial processes, measured in Million Tons of Oil Equivalent, or MTOE) to the amount of CO2 emitted (measured in million tons of CO2), we can calculate how many tons of CO2 are emitted for each ton of energy consumed – or how dirty a given economy’s energy mix is. This is a skewed number, as primary consumption does not include personal transportation, which has an outsized impact on emissions. 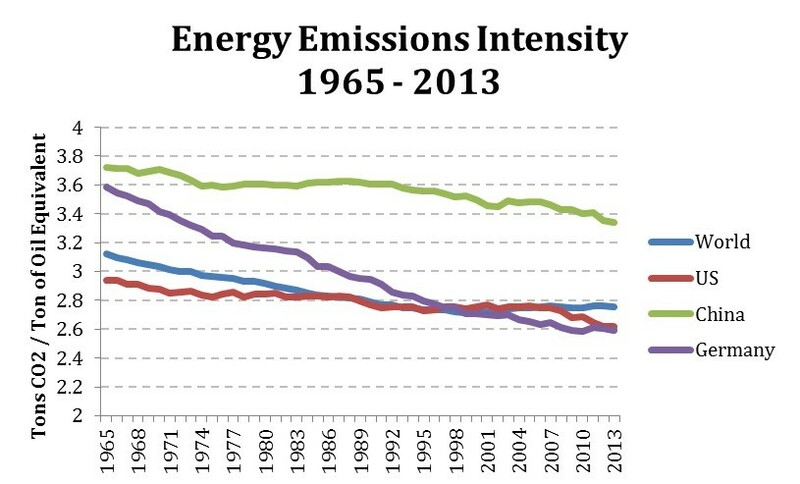 However, the news is encouraging: emissions intensity has declined somewhat over the last four decades. Global intensity is down by roughly 12% over the last fifty years, China and the US by 10-11%, and Germany by a whopping 28%. While these are good things, it should be noted that progress has been extremely slow, taking upwards of fifty years (the exception in the US, where notable improvements have been seen over the last three years). Comparing primary energy consumption (in MTOE) to coal consumption (also in MTOE), we can get a sense of coal’s share of a given energy mix. The above chart shows that this share has dropped globally, with the most marked decline coming in Germany and, interestingly, China (61% and nearly 22.5%, respectively). Much of the global use of coal is concentrated in the usual suspects: China, India, and to a lesser extent countries such as Indonesia, Russia, and Australia. This reflects coal being the fuel of choice for rapidly-industrializing nations who need vast amounts of cheap energy to fuel their growth. Even as China has moved towards a less coal-reliant energy mix, overall usage has risen, suggesting that China is augmenting, rather than replacing, coal with cleaner alternatives. 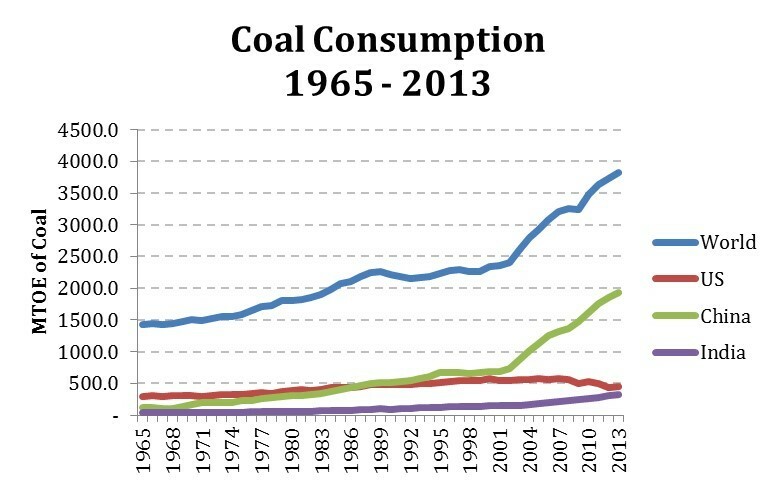 However, as we have already pointed out, coal is on the decline in the US, historically the largest coal producer in the world, in terms of both production and consumption. 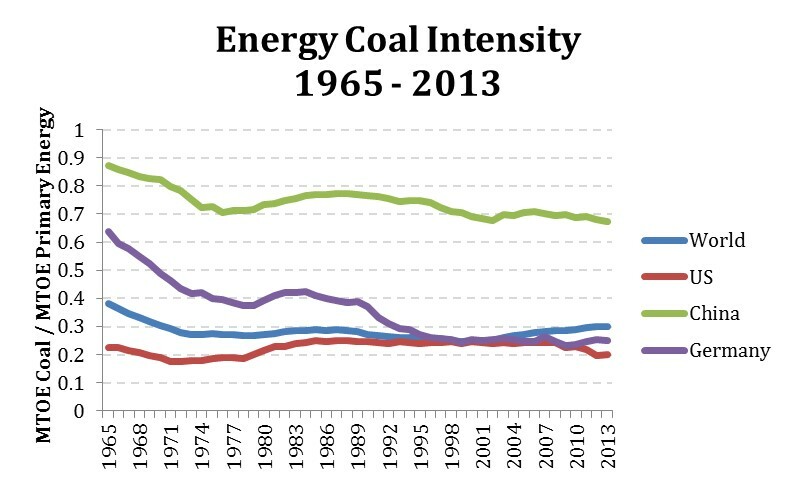 So, where is the coal coming from? As China rapidly industrialized, and the US coal sector declined, much of the global slack was picked up by Chinese, Indian, and Australian mines. This has been clearly demonstrated by the recent major moves in the coal industry. 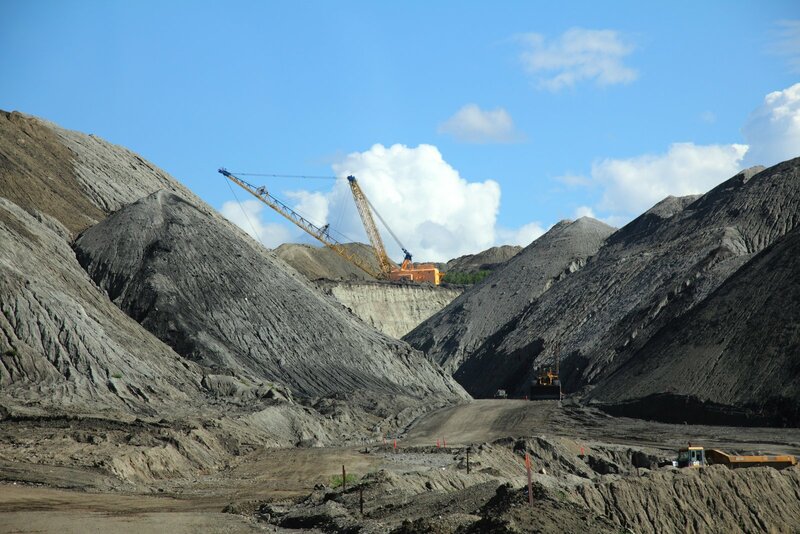 Having spent close to 120 years mining the rich Appalachian seams, most US companies have relocated to either Wyoming (where 40% of US coal is produced in just two counties in some of the largest mines on earth) or abroad, snapping up mines in Australia, Indonesia, or India. 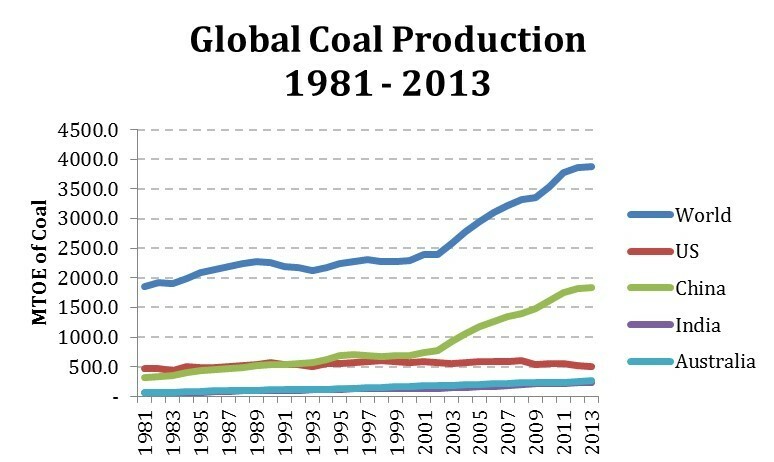 Despite the declining share of coal in the world energy mix, and the drop in global emissions intensity, the rapid rise in global economic activity over the last thirty years has resulted in a rapid rise in global energy use, and therefore in global carbon emissions. If we are serious about addressing climate change, this will have to change. So, in summary, in some ways the global economy is cleaner and more efficient than it has been at any other time in history. In other ways, it’s not nearly clean or efficient enough.